CEO Bin Yu founded Utegration, a provider of consulting, customization and implementation solutions to the utility industry, in 2008. Capitalizing on the utility industry’s demand for digital data integration, the firm quickly carved a valuable niche, earning recognition as SAP’s 2015 Utility Industry Partner of the Year. Not surprisingly, many suitors came calling, even early on. One such unsolicited offer to purchase the business got their attention, prompting them to reach out for the advice of GulfStar Group Managing Directors, Colt Luedde and Roshan Gummattira. In the case of the unsolicited offer that Utegration received, Colt and Roshan provided extensive analysis and consultation with Bin and co-owners David Head, Eric Polnau, and Alan Tan. Ultimately after a great deal of careful consideration and under the advice of GulfStar, the owners of Utegration elected to decline this offer. Many elements influenced their decision. In particular, they knew that Utegration was poised for tremendous growth because of their deep domain expertise in the utility sector, SAP capabilities and high-caliber talent in the U.S. and India. They wanted to participate in their company’s future upside and preserve its culture, which had been so carefully crafted. So, it was time to take their company to the market. Or was it? As part of the original deliberations about whether or not to proceed with the initial offer, GulfStar and Utegration had discussed the benefits of running a controlled, yet broad process, including both private equity and strategic buyers, not only to bring more competitive options to the table but also to find the best partner for the future. After declining the initial offer, the expected course of action might have been to immediately commence such an M&A process. However, in a defining moment for everyone involved, GulfStar advised Utegration to pause. Utegration’s business was accelerating and by simply waiting a few months, the value of the company would significantly increase. The brief intermission strategy paid off. 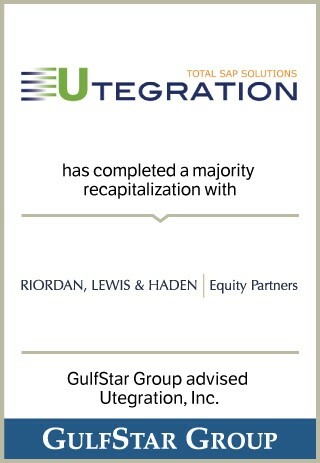 GulfStar took Utegration to market in May of 2016 and closed on a majority recapitalization deal with RLH in early October. The transaction allows the owners to retain a portion of the business while partnering with a firm that respects their culture and provides the financial and organizational support to help Utegration achieve even greater success. And when that happens, they have the additional opportunity to profit a second time, if the company is resold in the future. Bin describes the experience this way. GulfStar doesn’t just do their job. They’re more like a part of us. They got into the details and the tactical side of our business. It was amazing. And where we ended up was the ideal situation.